Ahhh, the vacation recap(s). Boring to everyone else but me and my family! A little backstory...my brother has been living in San Diego since August. He is out there for work for a whole year, and his company has been paying for everything--gas, groceries, rent, you name it. He's basically living the dream. So for Christmas, he told me all he wanted was for us to come visit him in Cali. It was basically a free vacation (except our plane tickets, of course)! Done and done. We left Thursday, April 2 after school. I was hoping Ella would fall asleep on the plane, since it took off at 6:30 and she normally goes to bed around 7. The plane ride was a bit of a nightmare, but we survived! I told Travis when we got off that 5 hour flight, that it had felt 10 times longer than our flight to Europe. 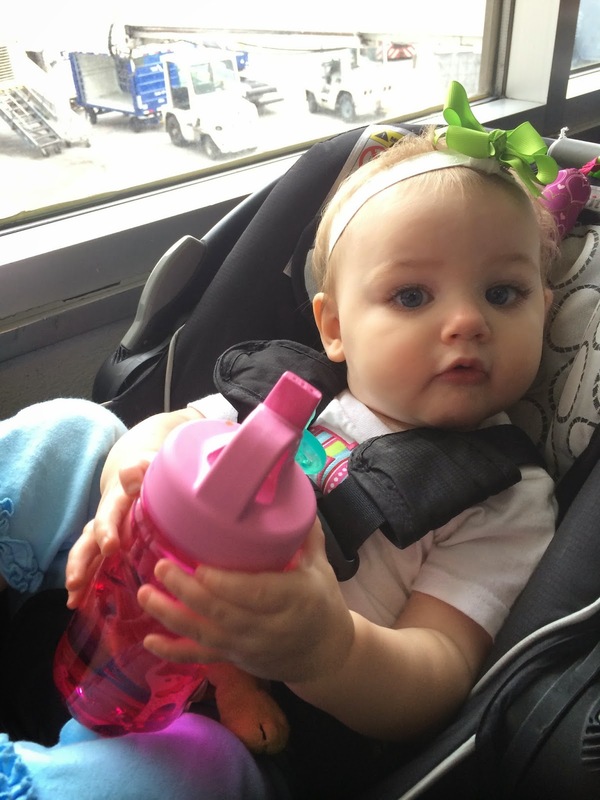 We landed at 11:45 our time (8:45 PST) and Ella had not slept one wink since her afternoon nap. Good times all around. But the fun did not end there. Oh no. Of course not. At the baggage claim, the carousel kept going around, and around, and around...and around. And then it stopped. WHERE WAS MY BAG?! Yes, thank you US Airways, for losing my huge, bright pink suitcase on a DIRECT flight out of your HUB airport (oh! and we had checked in with plenty of time to spare before our flight...). To say I was extremely pissed would be putting it lightly. There were tears from me (and Ella who was exhausted at this point) involved. An hour later (that's how long it took to get a claim taken care of because there were several other people in my same boat! ), we get in my brother's car and head immediately to Target. At this point I noticed my poor child had soaked through her diaper...we were all exhausted...I had no bags....it was pitiful. Just pitiful. $70 later (and does US Airway reimburse? bc that would be nice, considering...), we had some clothes and essentials to get us through the next day until my bag arrived. Ok, so Friday was a new day! I had my lovely Target attire...as did Ella, although she had no hair bow to match, so please don't judge us on this days' pictures! First stop was brunch, followed by La Jolla Cove. Gorgeous views of the ocean! At La Jolla cove, there is a big beach where the sea lions hang out, and you can go right up to them (or, as close as they'll let you)! Ella and I walked down to see them....they were SUPER stinky though! That guy on the left actually barked at us when we tried to get on his rock! After we left La Jolla Cove, we headed up the mountain to Mount Soledad. More gorgeous views (are you beginning to see why I took so many pictures?)! We went back to my brother's house so Ella could take a quick nap and I could try to locate my suitcase (which had still not shown up). After an hour or so, we were ready to do more sightseeing, so we went out on Point Loma. First, we checked out the tide pools there. I just loved how cool the rocks looked! And we found some sea urchins in the little tide pools. We were about 10 miles (maybe a little less) from Mexico, but Travis and I both got text messages from our cell phone providers saying "Welcome to Mexico." We kind of freaked out, but I'm happy to report that we did not get billed for any international calls or data! Bless poor Ella's heart...she was so done at this point. But we can't stop now, it was only 5:00! So we headed to Pacific Beach. There is a huge pier in Pacific Beach that you can walk out on (duh), so we did that. There were cars and houses on it! Crazy! We got back to my brother's house...and this time, my suitcase had arrived!!!!!!!!!! Tell me, how does one lose this bad boy?!? We celebrated the return of my luggage with dinner at La Piñata. 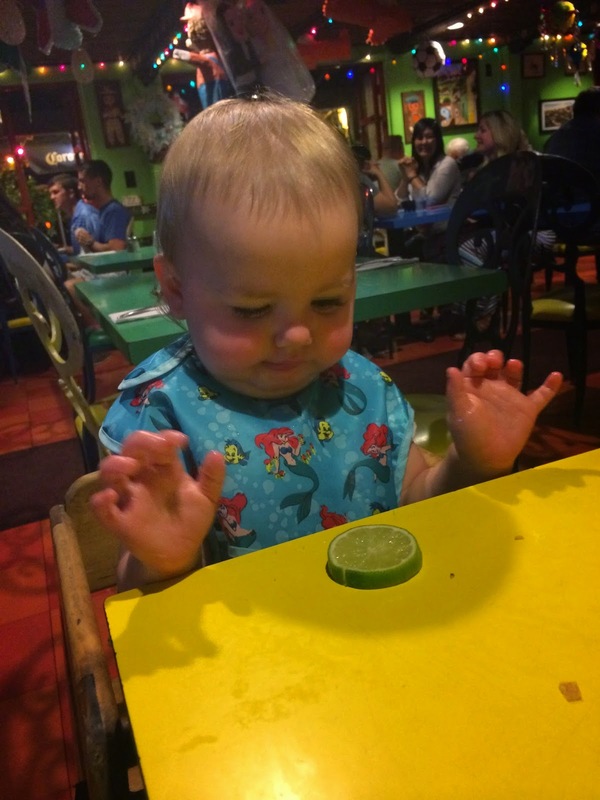 Ella tried the lime from my margarita...not what she was expecting! Ok, so now that we have luggage...next up is the ZOO! 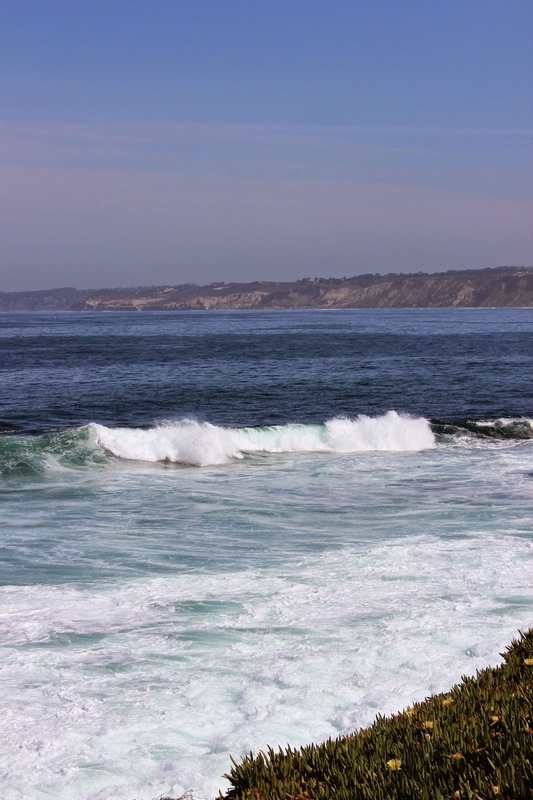 Ah La Jolla is just pretty! Your brother is lucky to live there for a year! 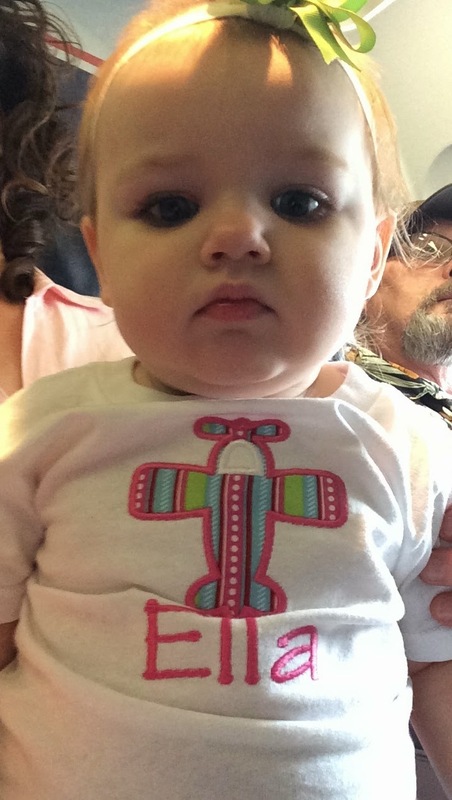 Sorry your flight was less than great....I can't believe Ella didn't sleep a wink! Too much excitement!